I thought I would write down my experience with breast cancer because when I was first diagnosed at 41 I used to spend hours on the computer trying to find other people with similar situations as myself and I wanted to see what their story was and how they coped with it all. So I’m hoping, in some small way, you might feel better after reading this or have someone in your life who you are supporting and this will make you feel more confident about what is going to happen with them. DISCLAIMER: This is very important, I AM NOT A MEDICAL DOCTOR AND I HAVE NO MEDICAL TRAINING, please refer to a professional medical consultant for medical advice. This is merely my experience of cancer and my own choices and does not attempt to influence you in any way when it comes to your own decisions. Let’s go back a bit. True confession, I had always worried I would get cancer. Which I know sounds a little strange but this is what I used to worry about. We had immigrated to the US when my kids were quite young and my main concern would be that I would not be able to take care of my children because my husband worked long hours. I also worried endlessly about the costs. However, I used to remind myself that I had breast fed my children for 3 years in total, I had no history of breast cancer and my Dr had once remarked that I would never get it. Well that turned out to be very much NOT TRUE!!!! One day I was in the bath and my hand brushed against a “lump” that felt hard, but smooth. My heart sank and I instantly “knew” it wasn’t good. My immediate thought, was great, I knew it! As if somehow being right was a good thing, cue eye roll. I made an appointment to go to the Dr, but to be honest, it was not straight away. I think I was hoping that it might just go away, like a cyst. Eventually after a few weeks I went to the Dr and he examined my breasts and he too thought it was a cyst and that if it was still there after I came back from my trip to Africa, I should go and get a mammogram. Which in hindsight, was wrong. I should have gone and gotten it checked out straightaway. When I got back it was still there and so I went and had a mammogram. 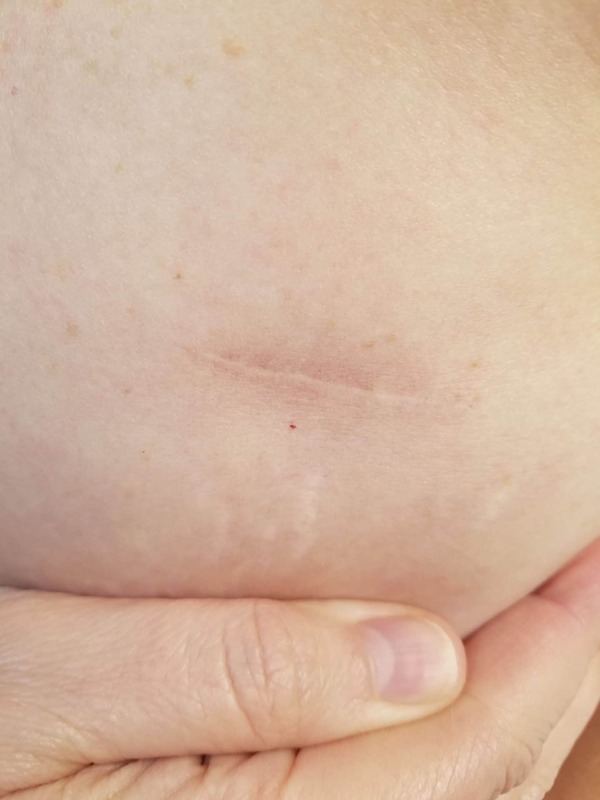 I had a big “X” marks the spot on my breast and yet, still, they only called me back 48 hours later, to the point that I was like, oh well, this is clearly not an emergency. My thought (and it is merely my thought process) is that it was actually difficult to find because I had very dense breasts. The Nurse from the Drs office called me and said I needed to go in for an ultrasound. She sounded terrible when she called and I had done some interim research and so I asked her what the Bi-Rads score was (this is a score from 1 to 5 that is assigned by the radiologist, 5 being cancer) and she said it was a 5 but that it still needed to be confirmed. But it was the highest Bi-Rads score you can get so in my heart I knew. That is truly the hardest part, when you know in your heart you have cancer and you don’t know the severity of it. I was such a mess, I could not think straight but I didn’t want to alarm my kids who were 9 and 7 at the time. So I tried my hardest to be brave and focus on just getting through every day. I used to sit in my closet and cry! And that’s when I used to google and google ALL the stats and all the stories, desperate to find out something about what I would be experiencing. At the ultrasound you could clearly see a spiky mass in my breast (most benign tumors are round and smooth shaped). I didn’t even have to wait as I knew already what was on the cards. A punch needle biopsy confirmed it all. It was cancer. And this is where you have to trust whatever it is you do, your own intuition, your sprituality, the Universe, whatever it is that you hold on to in really desperate times, this is when you get a grip on it. Now, one of the things during this whole process, was the fact that I kept on getting “signs”. Which is so “woo-woo” right?! However, I believe we choose to see “signs” and I want to encourage you to look out for them too. I wrote an article about “Looking for the Beauty in Life” which explains this a little more. I was given a list of Drs to call. I could not get through to the first Dr but managed to connected with the next Surgeon on the list. She was my saving grace. She not only managed to be quite blase about it all (you’ll be fine she kept on telling me) but she also told me which Oncologist to see and she turned out to be the most wonderful person. She lived in my neighborhood, her kids were at the same school as mine, she was the same age as me and her husband had recnely been treated for cancer. Sign No.1 was getting the right people in my life. Tip: Embrace all the amazing medical professionals around you, feel blessed by their knowledge and commitment to saving your life. I picked up my Bible, closed my eyes and prayed for a verse that would help me. I can’t remember which one it was exactly but it was about God being there as you went up the mountain and in that moment, I felt surreally calm. Tip: Find your peace, search for it and when you find it, hold fast to it. The other thing, and this is very difficult to write and will probably be difficult to read, is that I became very calm about my children. It suddenly occurred to me that possibly my greatest gift in life was to be able to give birth to them. That they would make their way in the world and I was being selfish by thinking that I was the only person that would influence them or encourage them, or even love them. Does that make sense? The fact that I could give them life was my role and that I didn’t necessarily have to feel guilty or even angry that I might not be able to see it through. Tip: Let go of your guilt, it isn’t your fault that you have cancer, you are not letting anyone down. I called my sister-in-law to tell her that I had been diagnosed and she said “I know”! What??!! She had had a dream the night before about feeling a lump and having it removed, in tact, like a pea. That’s what I wanted to hear, just like a pea, removed intact. I literally visualized that before I went in to surgery. Tip: Visualize yourself with no cancer, either through surgery or through treatment. The final sign, my dearest friend who I had grown up with in South Africa, was diagnosed a month before me and she spent time Skyping with me going over what it all felt like, what to expect and so many useful tips. She even showed me her head without hair and so I felt so prepared and she looked healthy and well and again, I visualized myself looking like her. Tip: Know that there are SO, SO many of us in the same situation, you are not alone in any shape or form. You are going to be amazed at how many people have been on the same journey as you. My surgeon started to discuss options of surgery. It was quite interesting in that it wasn’t this immediate, get in to surgery NOW type of thing, I actually was only scheduled a few weeks out, no-one was rushing. One of the things the surgeon suggested was to have a more detailed look at my breasts, via mammogram with radiation to see if it was in both breasts. If it was and also if I was a carrier of the BRACA gene then I would opt for a mastectomy otherwise she suggested a lumpectomy. When I went to have the mammogram the lady doing it said, ‘I am a 10 year survivor, would you like to see my scar’?. OF COURSE I BLOODY WELL DID!!! The thing is, whatever your “scar” looks like, whatever procedure you end up doing, it’s all really, really beautiful, because you are. Scars are merely road maps to life. We should share them like badges of honor. I also opted for an Oncotype test and my results came back as a 26 which was quite high and it was suggested I had chemo as an “insurance” policy. I was totally fine with that and had a port inserted. It’s super easy, quick day surgery and then they don’t have to try and find your veins, it’s nice for drawing blood too. Since I was BRACA Neg and there was no other evidence of cancer in my other breast I went in and had surgery on the 1st March and my surgeon came in and said she had “got it all” which was all I needed to hear in that moment. And I hung on to that, so fiercely and visualized her cutting out the lump and it being gone (as per my sis-in-laws dream). I also had a Sentinel Node biopsy and she ended up taking out 4 nodes as they were matted together. So in my head, and it is still in my head every day, is that it is gone and was gone on that day. I went home in the afternoon. Yes, I did actually just embrace the fact that I had to have chemo. I guess it was beccause I saw my friend handling it so well that I knew that I could too. The first chemo session is so odd, because you feel so healthy and well and not ill at all. I went in and was pleasantly surprised at how “festive” it can be and how friendly everyone was. I had my husband and a really good friend with me and she had bought blankets and food which is ESSENTIAL, note to self, it’s freezing and you will be so hungry. I was working part time, so I did feel in the last two rounds (I had four in total) that it took me longer to recover from them. I would take a week off and then work for two weeks. The worst part is your tastebuds change so much. I developed a craving for beer which I have always hated! Nothing really tastes that good, popsicles are useful to have around. It happens, shave it off, get a wig and it will start to grow back before the end of your last chemo. I thought it would be the worst thing in the world, IT WAS NOT AT ALL! I had a wig called “Barbara”, my kids named it. I didn’t actually wear it that often, I preferred scarves and buffs (which are amazing). One of the beautiful things that came out of wearing a headscarf was having other women come up to me ALL THE TIME and say, “oh that was me 10 years ago” etc. There were so many lovely stories. There was also someone that said “do you wear head coverings because you can’t be bothered to do your hair”. Oh it was so hilarious when I said “No, I’m having treatment for cancer”, her face, priceless! People will ask you how they can help. It is such a difficult question to answer because you don’t always know what help you will need. But accept it all, it’s truly such a gift and it will make other people feel so good about themselves too. I accepted meal trains (best thing ever!). I had help with my kids, they loved all the extra attention, I appreciated every kind word and note. Even though I’ve just said “accept all the help”, one of the hardest decisions I made was to send my parents home before my chemo started. They had come out to stay for a few weeks whilst I prepared. The main reason I did that was that I didn’t want to look “sick” in front of the kids, because in reality I wasn’t actually “ill”. It was so tough because my Mom is the most amazing “Nurse” but I’m glad I did that because I made myself get up every morning and see them off to school and made sure I was up in the afternoon to see them too. However, that was my decision and if you need extra help, take it all!! I can’t say the worry gets any less but then I worried so much BEFORE I got cancer that it really doesn’t make any difference in my life. The best thing though, is that I faced my worst fears and came out the other side. My attitude towards life is so different now! I’m still a pretty anxious person but that is just who I am, but I certainly don’t tolerate people and situations that I don’t feel like are enhancing my life. I honestly see this as a “blip” in my life. Was it great, nope, not particularly. Was it the worst thing ever, no. It was a “tunnel moment” when you are in the dark for while and then you emerge. Into the light, into the future, armed with power, and fortitude and a blazingly strong spirit. I hope in some small way, this might make you feel better if you are going through this, or if you are supporting someone else you have a better idea of what to expect. Please contact me if you have any questions (non-medical related) and I will be happy to answer them if I can. You are an inspiration to others going through the same thing. Can’t believe 6 years have passed since your diagnosis. Well done for keeping it together for the kids. Think this too makes you stronger. Sometimes it is too easy to give up and let self pity take over. Not an easy time of your life, but you got through and come out the other end shining. I’m thrilled you have found Gorgeous with Grace.